Happy Kitchen Sink Stamps Monday! Thanks so much for stopping by, I hope you are enjoying this Memorial Day Holiday! Today, I created a card and video using Kitchen Sink Stamps Multi Step Wedding Couple, to create a Vintage Wedding card. I have photos of my grandparents when they got married, printed in Sepia colors, and was inspired to recreate that vintage wedding look using the Bride and Groom. Don't be intimidated with the Multi Step Stamping using 6 images. Stamping them as I did to create a Sepia look is a breeze! You can also use "spot stamping" to add color to the Flowers, by following the Tutorial Maria posted here. Basic Grey came out with some wonderful papers in their Cappella Line that work perfect with these images, to create some wonderful Wedding/Anniversary cards. I added some Flourish Pearls under my stamped panel, then some flowers cut from the Capella paper using the Tattered Floral Die by Tim Holtz. The edges of the flowers are sponged with Chocolate Ink, popped up on dimensionals, then I added a Half Pearl to the centers. The sentiment is also from this set, stamped in Chocolate. Wow Lisa, this turned out so FAB! Luv the addition of the pearls. Going to watch the video now. You know what they say about great minds!! That gorgeous cappella BasicGrey is stunning with your vintage wedding couple! Love the pearl swirls and punched blossoms!! What awesome stamping on this bride and groom!! Sensational wedding card, Lisa! And your wonderful videos demonstrate to all how easy layered stamping can be!! 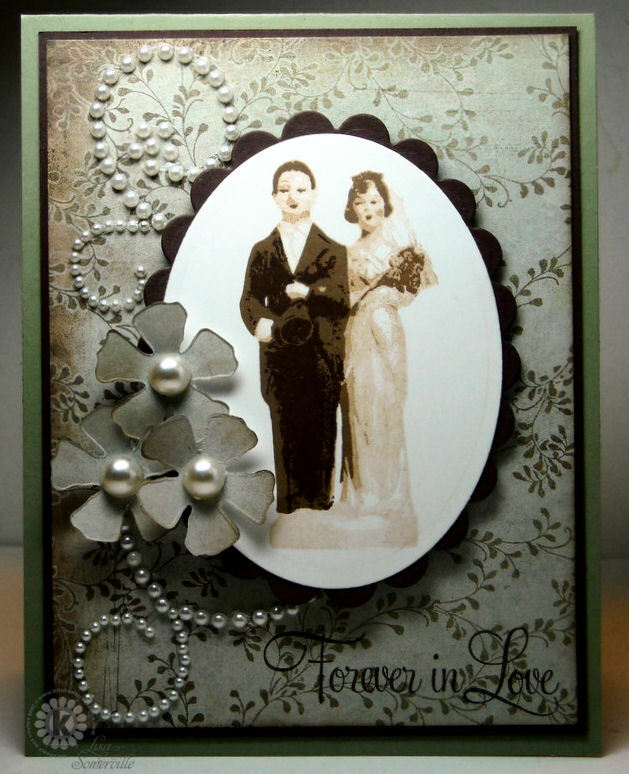 Such a beautiful card Lisa, I love the pearls behind the main image and the flowers on top. I love the vintage feel with that perfect paper. Wow! Oh my goodness!! Lisa, this is so beautiful!! I love the elegant look and elements you used with the couple image! Another great video, too!! Love the vintage couple. The pearls are perfect! Wow, this is so beautiful. Very elegant and just gorgeous. I love the pearls and the paper is perfect! Thanks for sharing. Ab Fab Lisa! Love the layout and the pearls are perfect for the vintage look! Great video, explains it in easy-to-follow steps. Great job, you're a celeb! Thanks so much!